Finite-difference groundwater-flow simulations of infiltration from hypothetical stormwater infiltration structures (which are typically constructed as basins or dry wells) were done for 10-acre and 1-acre developments. Aquifer and stormwater-runoff characteristics in the model were changed to determine which factors are most likely to have the greatest effect on simulating the maximum height and maximum extent of groundwater mounding. Aquifer characteristics that were changed include soil permeability, aquifer thickness, and specific yield. Stormwater-runoff variables that were changed include magnitude of design storm, percentage of impervious area, infiltration-structure depth (maximum depth of standing water), and infiltration-basin shape. Values used for all variables are representative of typical physical conditions and stormwater management designs in New Jersey but do not include all possible values. Results are considered to be a representative, but not all-inclusive, subset of likely results. Maximum heights of simulated groundwater mounds beneath stormwater infiltration structures are the most sensitive to (show the greatest change with changes to) soil permeability. The maximum height of the groundwater mound is higher when values of soil permeability, aquifer thickness, or specific yield are decreased or when basin depth is increased or the basin shape is square (and values of other variables are held constant). Changing soil permeability, aquifer thickness, specific yield, infiltration-structure depth, or infiltration-structure shape does not change the volume of water infiltrated, it changes the shape or height of the groundwater mound resulting from the infiltration. An aquifer with a greater soil permeability or aquifer thickness has an increased ability to transmit water away from the source of infiltration than aquifers with lower soil permeability; therefore, the maximum height of the groundwater mound will be lower, and the areal extent of mounding will be larger. The maximum height of groundwater mounding is higher when values of design storm magnitude or percentage of impervious cover (from which runoff is captured) are increased (and other variables are held constant) because the total volume of water to be infiltrated is larger. The larger the volume of infiltrated water the higher the head required to move that water away from the source of recharge if the physical characteristics of the aquifer are unchanged. The areal extent of groundwater mounding increases when soil permeability, aquifer thickness, design-storm magnitude, or percentage of impervious cover are increased (and values of other variables are held constant). For 10-acre sites, the maximum heights of the simulated groundwater mound range from 0.1 to 18.5 feet (ft). The median of the maximum-height distribution from 576 simulations is 1.8 ft. The maximum areal extent (measured from the edge of the infiltration basins) of groundwater mounding of 0.25-ft ranges from 0 to 300 ft with a median of 51 ft for 576 simulations. Stormwater infiltration at a 1-acre development was simulated, incorporating the assumption that the hypothetical infiltration structure would be a pre-cast concrete dry well having side openings and an open bottom. The maximum heights of the simulated groundwater-mounds range from 0.01 to 14.0 ft. The median of the maximum-height distribution from 432 simulations is 1.0 ft. The maximum areal extent of groundwater mounding of 0.25-ft ranges from 0 to 100 ft with a median of 10 ft for 432 simulations. Simulated height and extent of groundwater mounding associated with a hypothetical stormwater infiltration basin for 10-acre and 1-acre developments may be applicable to sites of different sizes. For example, for a 20-acre site with 20 percent impervious surface, the stormwater infiltration basin design capacity (and associated groundwater mound) would be the same as for a 10-acre site with 40 percent impervious surface. A spreadsheet was developed to solve the Hantush analytical equation, which can be used to calculate groundwater mounding. The Hantush equation incorporates simplifying assumptions, including that all flow is horizontal. The spreadsheet accepts user-supplied values for horizontal soil permeability, initial saturated aquifer thickness, specific yield, basin length, basin width, and duration and magnitude of recharge rate. Comparison of results of finite-difference simulations of a multi-layer system that includes a vertical component of flow in the saturated zone with the results from the analytical equation indicates that the horizontal-flow-only assumption in the analytical equation can cause an under-prediction of the maximum height of a groundwater mound by as much as 15 percent. The more realistic representation of the vertical component of flow and the ability to include site-specific details make finite-difference models such as MODFLOW potentially more accurate than analytical equations for predicting groundwater mounding. This spreadsheet solving the Hantush (1967) equation for ground-water mounding beneath an infiltration basin is made available to the general public as a convenience for those wishing to replicate values documented in this report or to calculate values based on user-specified site conditions. 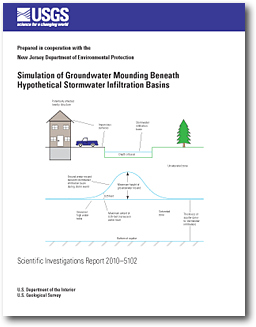 Carleton, G.B., 2010, Simulation of groundwater mounding beneath hypothetical stormwater infiltration basins: U.S. Geological Survey Scientific Investigations Report 2010–5102, 64 p.